Port wine stain (PWS), also called nevus flammeus, is a congenital, cutaneous vascular malformation. It involves post-capillary venules which produce a light pink to red to dark-red- violet discoloration of human skin. PWS occurs in an estimated 3 children per 1,000 live births, affecting males and females and all racial groups equally. There appears to be no hereditary predilection for PWS within families. There are no known risk factors or ways to prevent PWS. Check out this Web-MD article or this slideshow of port wine stains at the Mayo clinic. Since most of the malformations occur on the face, PWS is a clinically significant problem in the great majority of patients. PWS should not be considered a cosmetic problem but a disease with potentially devastating psychological and physical complications. Detailed studies have documented lower self-esteem and problems with interpersonal relations in PWS patients. The cause and origin of PWS remains incompletely understood. It is believed that PWS develop within the first 2-8 weeks of gestation. The most likely hypothesis for the development of PWS is the deficiency or absence of surrounding neurons regulating blood flow through the ectatic post-capillary venules. As a result, the blood vessels are unable to constrict normally and remain permanently dilated. PWS is a progressive vascular malformation of the skin. PWS remain throughout life; there is no involution. PWS are well demarcated and flat and grow proportionately in surface area with the child. In infants and young children, PWS are flat red macules. 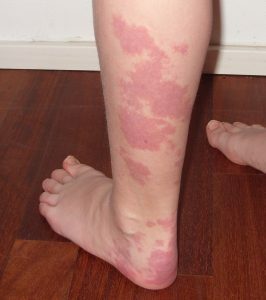 However, the lesions tend to darken progressively to purple and, by adult age, often become raised as a result of the development of vascular papules or nodules. These changes in color and contour are attributed to progressive ectasia of the abnormal dermal vascular plexus. Over time, blood vessels become more dilated and susceptible to spontaneous bleeding or hemorrhage following minor trauma. Bleeding can be difficult to control, necessitate hospitalization and may also increase the likelihood of skin infection. If left untreated, PWS often become incompatible with normal life due to the development of vascular nodules on the skin surface which can often bleed spontaneously with incidental trauma. The hypertrophy (increased tissue mass) of the underlying soft tissue that occurs in approximately two-thirds of lesions further disfigures the facial features of many patients. For all of the above reasons, most medical specialists agree that it is essential to begin treatment of PWS as early as possible and to maintain treatment in order to prevent the development of vascular nodules and hypertrophy in later years. The pulsed dye laser in conjunction with cryogen spray cooling (“dynamic cooling device” or “DCD”) is now the treatment of choice for PWS. Yellow light produced by the pulsed dye laser penetrates up to 2 mm into the skin and is preferentially absorbed by hemoglobin within the dilated PWS blood vessels. The heat within the vessel lumen causes blood vessel damage which is evidenced by intense purpura (“bruised” appearance of the skin). Several treatment sessions spaced at 4-8 week intervals are required for maximum efficacy. The number of treatments required for maximum PWS fading can be variable and unpredictable. Treatment side effects are mainly limited to post-operative swelling and purpura, which generally resolves within 2 weeks. With the addition of cryogen spray cooling, the risks of scarring or changes in the normal skin pigmentation are minimal after pulsed dye laser therapy performed by an experienced physician. We invite you to learn more about treating port wine stain in this rebuttal published by Dr. J. Stuart Nelson and Dr. Roy Geronemus in the New England Journal of Medicine. Multiple pulsed dye laser devices are now available for PWS treatment, each with its own unique wavelength and pulse duration. Changing the wavelength or pulse duration of the laser can result in substantial PWS fading not previously observed with single device therapy. Moreover, several devices are sometimes used during an extended treatment protocol in order to destroy vessels of different sizes. Studies have recently shown that aggressive treatment of infants and young children at earlier ages improves port wine stain clearance. There are several “optical” advantages to treating patients at as young an age as possible: 1) less epidermal melanin which competes for the absorption of laser light; 2) less collagen in the skin results in less light being back-scattered out of the skin; and 3) thinner dermis and lower fractional blood volume in younger patients allows more light to penetrate into the skin to destroy targeted PWS blood vessels. It has become clear that treatment of a PWS early will prevent the development of the hypertrophic component of the lesion. Postoperative biopsies after laser treatment of a port wine stain reveal that the existing blood vessels are smaller and fewer in number compared with pretreatment biopsies. Thus, the opportunity for progression of these lesions to a more ectatic state is less likely to occur. Although the majority of port wine stain lesions do not recur, some lesional redarkening many years later has been reported after successful PDL therapy. One possible explanation might be continuous dilatation of the remaining ectatic vessels which also lack autonomic innervation. Patients who do experience some redarkening will usually only require one or two treatments to return to their former level of port wine stain blanching. The latest research, published March 2019, concludes that early treatment of port-wine stains with laser therapy, without anesthesia, is both safe and effective. Read more at Pulsed Dye Laser Treatment of Port-Wine Stains in Infancy Without the Need for General Anesthesia. 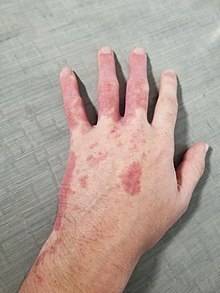 “The Sturge–Weber syndrome and port-wine stains are caused by a somatic activating mutation in GNAQ. This finding confirms a long-standing hypothesis.” Read more at Sturge–Weber Syndrome and Port-Wine Stains Caused by Somatic Mutation in GNAQ.